art ‣ The new Guggenheim/Google art and technology alliance gives a museum experience to anyone, anywhere with a computer. It's not yet like being there and maybe it never will be. Still, the opportunity to 'walk' through the Frank Lloyd Wright space and to interact with various works of art seems to us the start of something exciting and new: creating alternative and widely-accessible museum experiences. music ‣ Malibu, the new album by Anderson Paak, confirms his status as a genre-straddling (rap, soul, jazz) Talent. book ‣ The Queen of the Night is the much anticipated second novel by Alexander Chee, whose first, Edinburgh, was published 14 years ago. This new book is the story of a 19th century Parisian opera star and the sweep of her fascinating and, let's say, unconventional life. theater ‣ Playwright Lucy Prebble (ENRON) has a new play—The Effect (performed to acclaim in London) about two volunteers who complicate matters during a clinical trial of a high-potency antidepressant. Directed by David Cromer, previews begin March 2.
movie ‣ Requiem for the American Dream isn't exactly a money title. But in spite of its promise of a really bad date night, listening to Noam Chomsky discuss income inequality turns out to be absorbing and not entirely devoid of hope. 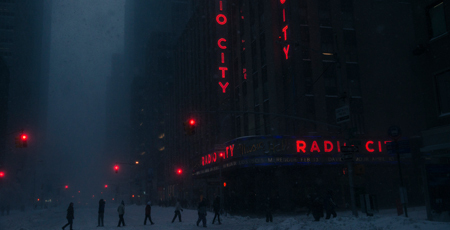 The excellent photographer Orestes Gonzalez sent us these images of the big snow to share with you. fri 7pm: historical documentary writer + director ric burns introduces a screening of stanley kubrick's dr. strangelove or: how i learned to stop worrying and love the bomb (1964) at the new-york historical society (uws). first-come-first-serve free tickets will be distributed starting at 6pm as part of pay-what-you-wish admission friday nights (6-8pm, reg. $12-19). fri + sat 7:30pm (+ 2/5-6, 2/12-13): musicians and visual artists create immersive multi-media landscapes over six nights at 'the basement performances' series, curated by composer and performer john zorn. the drawing center (soho), $10. fri + sat 8pm: spend a winter evening indoors with snow, a multimedia performance piece inspired by hans christian andersen's the snow queen, featuring a toy pianist, puppets, films and set pieces that become musical instruments. the invisible dog (cobble hill), $10 adv, $15 door. sat 11am-2pm: the flatiron's center for book arts annual winter open house offers printing and bookbinding demos, as well as info about upcoming classes. free admission. sat 7pm, sun 2pm: czechoslovak american marionette theatre performs 'the new world symphony: dvořák in america', a puppet theater work that explores the influence of african-american and native american music upon the work of composer antonín dvořák. bohemian national hall (ues), $19 general, $10 students/seniors. thru 1/31: more than 1500 anonymously artist-designed postcards are for sale for $85 each at the 18th annual 'postcards from the edge' group art show to benefit visual aids. friday's preview party costs an unskintly $50, but weekend admission is $5 suggested donation. sikkema jenkins + co. gallery (chelsea).